"There is in some minds a tendency toward a wrong love of the marvelous and mysterious, which leads to the belief that whatever is remote must be better than what is near." The San Francisco - Oakland - San Jose Bay Area. First impressions bring to mind postcard images of scenic bridges, stately Victorian homes, skyscraping architectural splendor, citified hills, civilized views. Then there's the other less glamorous imagery of mazes of clogg ed freeways, hideous urban blight, crass mall sprawl, plasticized cookie-cutter industrial and residential development. But wild places and open spaces? Certainly, the diverse, spr awling megalopolis must be contended with — and it is quite the cold, heartless, omni-present, Hydra-headed beast of mean streets and crime, off the charts murder rates, homelessness, relentless poverty and daily grind of unemployment and underemployment, a rat race of barely making ends meet, from paycheck to paycheck to no paycheck living for countless thousands, including - gulp! - Gambolin' Man. But the secret to staying sane in all the social blight and economic madness is the beast is entirely escapable! It doesn't have to swallow you up whole, chew you up and spit you out in tatters. The options for outdoor adventures and nature getaways – all mostly free for the enjoying! - are unlimited in the Bay Area. Beauty, fun, excitement and countless outdoor activities for all ages and sizes abound in a backyard radius of 40 miles - over 50 East Bay Regional Park District parks, upwards of 40 State Parks and State Historic Parks, nearly 20 State Beaches, a National Seashore, a National Recreation Area, a National Monument, several National Historic Sites, a National Estuary Preserve, and countless large and small county and city parks and open spaces. . .enough for a li fetime of exploration! Can we be any more blessed as dwellers in a predominantly urban area? The late, great world-famous mountaineer, traveler and photographer Galen Rowell, author of the coffee table picture / essay book, Bay Area Wild: A Celebration of the Natural Heritage of the San Francisco Bay Area (Mountain Light Press, 1997) noted, "If wild parts of the Bay Area could be designated as a single national park, it would be among the grandest in the nation. Its total land area would fall between those of Yosemite and Yellowstone National Parks, and its biodiversity - its wealth of plant, bird and animal spe cies - would exceed their combined total." If ever there was a clarion call inciting you to get off your lazy duff and head for the hills or shore, this is it! So – get to it! Go for a walk! Get on your bike! Hike! Run! Backpack! Enjoy a picnic! Paddle your kayak! Birdwatch! Paraglide! Surf! Horseback ride! Or else move to L.A.! Thanks to large tracts of middlin’ to impressive vertical relief created by geologic upheaval millions of years ago, Bay Area topography features series of folded landscapes, undulating and sweeping ridges, rugged and largely uninhabitable hills and canyons, along with hundreds of miles of ocean, lake, bay, river and marsh shoreline. 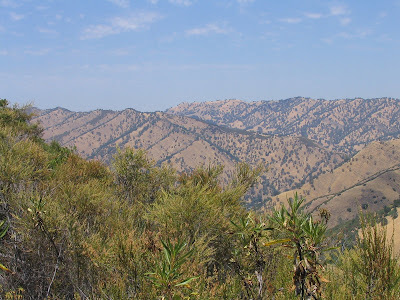 The diversity of landscapes and localized biomes – f rom northwest rainforest-like to southwest desert-like to temperate forest-like – provides for unique microclimates and unprecedented biodiversity. . .
. . .all of which is accessible by bicycle or car, by foot, and public transportation (so no excuses!). And it's all free (mostly) for the enjoying! If it came down to it, you don't even need a car, just time on your hands and unbridled enthusiasm for the simple miracles of creation all around you. What could be an easier and more delightful way to spend an entire day -- “time wasted is not wasted time!”-- than lollygagging in Mother Nature’s bounteous lap of luxury? Find yourself lost in time in an ancient grove of towering re dwoods. Stroll meditatively through a pretty oak or pine or bay or eucalyptus or manzanita forest pungent with the scent of fresh duff, aromatic foliage or dewy bark. 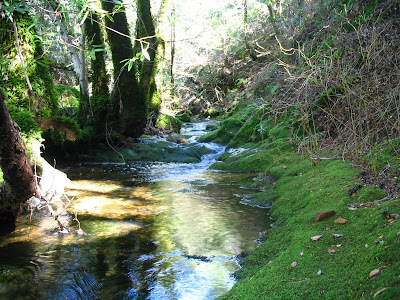 Become mesmerized by a sparkling stream flowing lazily in the sun. Climb a lung-busting mountain from bottom to top covering over 3,500 ft. of elevation gain (Sierran in scope!). While away endless hours beachcombing for pretty shells and colorful pebbles and washed up oddities along a remote sandy stretch of Pacific ocean. Daydream away a couple of hours on the reedy banks of a tranquil turquoise reservoir or celadon colored lake. Simply stop - look - listen - to marvel at every little thing in your path, which, as Henry Miller put it, provides i nexpressible joy-realization that "the moment one gives close attention to anything, even a blade of grass, it becomes a mysterious, awesome, indescribably magnificent world in itself." Suddenly, the journey, and the infinitude of "insignificant little things" encountered along the way, is what matters -- not the destination, or the number of miles ticked off, or how fast your time was, or how many way-points or longitude / latitude coordinates or geocaches you bagged. And so for once you have nothing better to do than take notice of the previously overlooked, the formerly unnoticed, the oft-unheralded, and mostly underappreciated insignificant little natural wonders. . .such as a velvet- smooth, bullet-shaped acorn which you caress softly between your fingers like a lucky talisman; a veritable hand grenade, a heavy and dense Digger pine cone, sticky with aromatic resin and armored with claw-like scales; the amusing spectacle of metallic blue bellied western fence lizards doing pushups on a lichen-plastered boulder; who-cares-what-they're-called pinhead lavender blooms carpeting an area next to an unheralded stream with pretty pebbles and reflections of glorious clouds; watch out! - a juvenile rattlesnake sunning on a little used trail; and looky there! – camouflaged the color of the redwood floor, an inch-long baby newt creepy-crawling up and over a stick. And of course, you take in the big things, too -- panoramic views atop Mt. 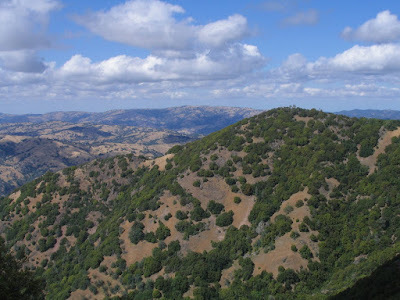 Tamalpais of remote Marin watershed lands; at Tuyshtak's (Mt. Diablo) summit you gaze out on a flawless day across the great Central Valley at Sierra snowcapped peaks stretching up and down an azure horizon for 300 miles; you espy golden eagles, northern harriers, red-tailed hawks, kites, great horned owls, and perhaps, if lucky, a regal bald eagle circling overhead in between nesting sites at Del Valle and San Pablo lakes; voles scurrying; ground squirrels scattering; blue jays screeching; butterflies fluttering; a field of wildflower drea ms; painterly grasses swaying in the wind; still life cows grazing on a bucolic hillside; a young coyot'l resting, half-hidden up the ridge; stringy moss-draped bay and oak trees evoking swampy Mississippian bogs; ocean waves crashing; tidal pools revealing their sanctuaries of innermost marine secrets; the magical allure of waterfalls and that ineffable sacred quality of simple water flowing through carved channels and bedrock on a homing instinct journey back to its oceanic origins. . .every little and big thing in your path. . .right here in your backyard. . . what are you waiting for? For the better part of twenty years I have had the privilege and pleasure of romping throughout the greater Bay Area seeking out places of power, solitude and repose where the soul can be restored and the mind and body rejuvenated (as well as be beaten, battered and bruised by the rigors of the particular activity engaged in!) I've always had a crazy driving impulse that keeps me from going insane, to just get out and go somewhere, do something, in the great outdoors, in natural settings, and to tell you the unjaded truth, I am rarely disappointed, no matter where I find myself in the Bay Area, for even amidst the throbbing throngs of humanity and jarring daily rhythms of “syphilization”, there is respite and retreat at every turn — restored creek beds in our East and South Bay hill cities; San Bruno Mountain overlooking the Peninsula and San Francisco; gorgeous little parks tucked away here and there in lush neighborhoods; a trail leading up the hill from concrete into ridgelands overlooking all the urban madness. So much green space has been preserved in these megalo-urban environs that it really boggles the mind, and easily explains why everyone wants to live here despite the high costs and aggravations of big-city life. For certainly, without the great green belts and vast oceanic stretches in our midst, this place would be just another L.A. Rowell realized that he would have "moved away from the Bay Area long ago were it not for the efforts of the few who have saved so much for so many." And we have t hose eco-pioneers, forward thinking early environmentalists, of nearly 80 years ago to thank, who crafted, with a single statement from a 1930 master plan, the vision that today is a reality: "The need is a vital one. . ..the charm of the region as a place in which to live will depend largely upon natural conditions that are destined to disappear unless properly protected for the public in general.. . ." AMEN! With such a plethora of choice locales at one's figurative fingertips, it's no big surprise that there remain wild places and open spaces I have yet to court. Perhaps, lazily, or to reduce the carbon imprint, it's too easy to keep returning to the tried and true, nearby, favorite stomping grounds of the East Bay and Marin County parklands, wild places and open spaces that abut, adjoin, hedge up against, rim, and keep out the encroaching surrounding cities -- the fabulous familiar haunts of the East Bay Regional Park District (Briones, Sunol, Ohlone, Morgan Territory, Redwood, Anthony Chabot, Diablo Foothills, Castle Rock, Black Diamond Mines, Pleasanton Ridge, Las Trampas, Del Valle, Tilden, Wildcat) – the regional State Parks (Mt. 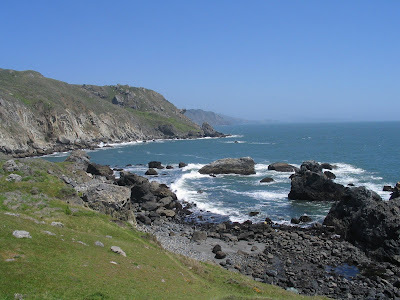 Tamalpais, R.L.S. / Mt. St. Helena, Samuel P. Taylor, Henry Coe, and Mt. Diablo) and national treasures (Marin Headlands, Pt. 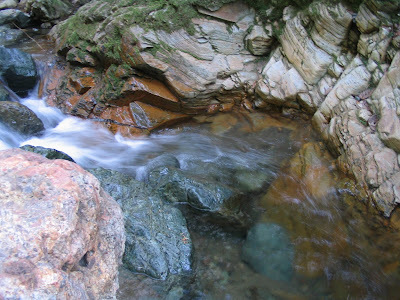 Reyes, and Muir Woods) – favorite Marin County redoubts (Cascade Canyo n, Cataract Falls, Pine Mountain, Stinson and Muir Beaches) – and some northern coast range paradises like Stebbins Cold Canyon Reserve, and Cache Creek Natural Area (although just out of the 40-mile radius). How is there time for it all? 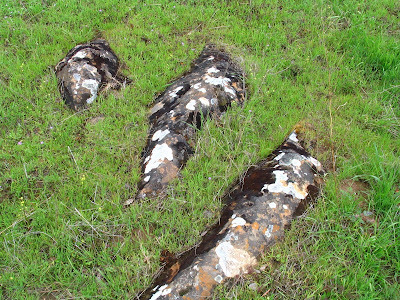 And, for some of the places mentioned, there are largely untouched areas I haven’t probed, poked into or explored. Not to mention what’s been left out, barely if ever visited – Big Basin, Angel Island, about 35 other East Bay Regional parks, China Camp, Mt. 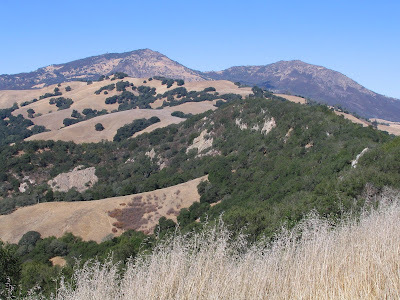 Burdell, and dozens of South Bay / Mid-Peninsula / Santa Cruz mountains wild places and open spaces. The protean beauty of th e Bay Area’s forests, trees, rocky outcrops, bodies of water, hills, mountains, ridges, canyons, fields, meadows, valleys, and views may not be singularly grandiose, magnificent or spectacular in the sense of Yosemite or Yellowstone or the Grand Canyon embodying monumental grandeur and iconic qualities, but what appear on the surface to be merely modest natural features are, in fact, great and small wonders of nature in our very midst, preserved eternally for all to enjoy in this lifetime and beyond. molecules every 30 days with the natural world and in a spiritual sense I know I am a part of it and take my photographs from that emotional feeling within me, rather than from an emotional distance as a spectator.” It would be my great hope if my photographs are able to convey a similar sense of emotional feeling, to draw you in as participant / observer, allowing you to connect in your own special way - emotional, spiritual, aesthetic - with the beauty and bounty of Bay Area Wild. 1. Stretch of Pacific Ocean on Hwy. 1 south of Half Moon Bay captured in pellucid late afternoon light, San Mateo County. 2. Swirling freshet cutting sensuously textured bedrock, Sugarloaf Ridge State Park, Sonoma County. 3. Pink painted hills, evoking Palm Springs desert scene, near Lake Berryessa, Stebbins Cold Canyon Reserve, Yolo County. 4. 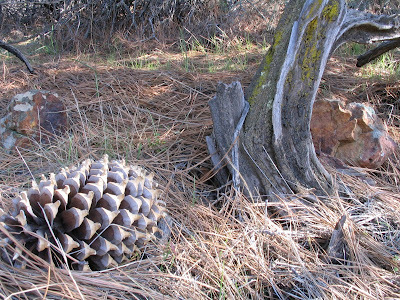 Digger pine cone, Back Creek Trail, Mt. Diablo St. Park, Contra Costa County. 5. Pretty pelagic view looking south from Steep Ravine, Marin County. 6. 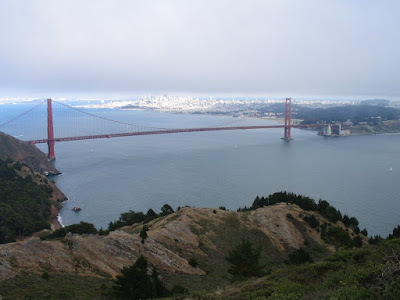 Classic view of the City through the Golden Gate Bridge, Marin Headlands, Marin County. 7. 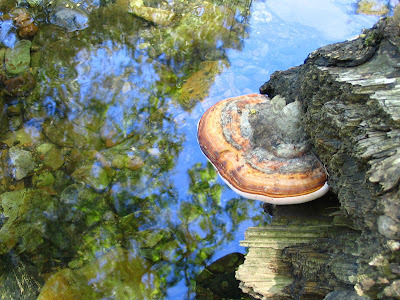 Shelf mushroom on rotting log over reflective waters, Cataract Trail, Marin County. 8. Brilliant field of purple lupine, Henry Coe St. Park, Santa Clara County. 9. 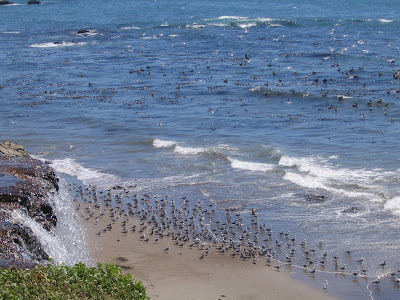 Feeding frenzy, Alamere Falls, Pt. Reyes National Seashore, Marin County. 10. 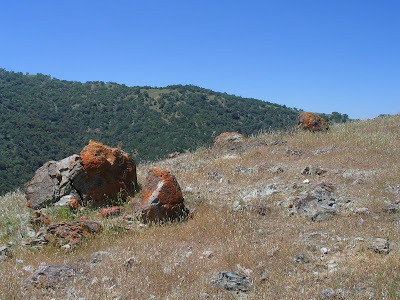 Colorful lichen plastered rocks atop ridge at Ohlone Regional Wilderness, Alameda County. 11. Steep Ravine gorge creek tumbler, Mt. 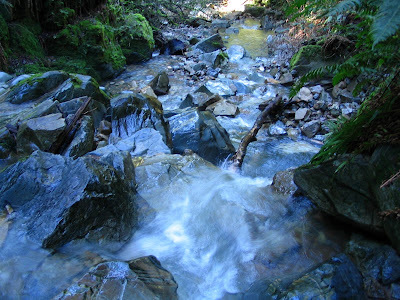 Tamalpais State Park, Marin County. 12. 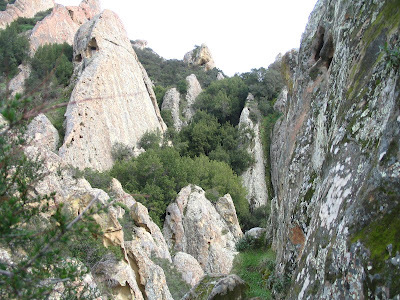 Psychedelic rocks, Black Diamond Mines Regional Park, Contra Costa County. 14. Mt. Diablo looking northwest from Morgan Territory, Alameda County. 15. 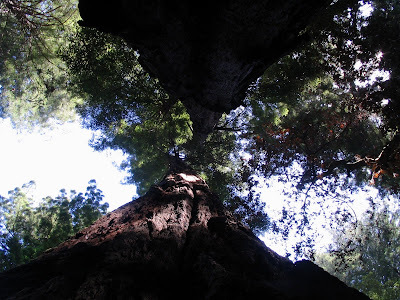 Sequoia sempervirens to the heavens, Muir Woods National Monument, Marin County. 16. Fantastical sandstone formations, Diablo Foothills Regional Park, Contra Costa County. 17. Stream, Matt Davis Trail, Mt. Tamalpais St. Park, Marin County. 18. 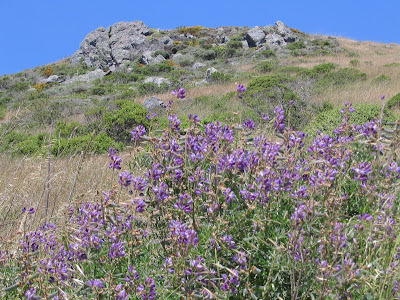 Wildflowers and bluff at Tennessee Valley, Golden Gate National Recreation Area, Marin County. 19. 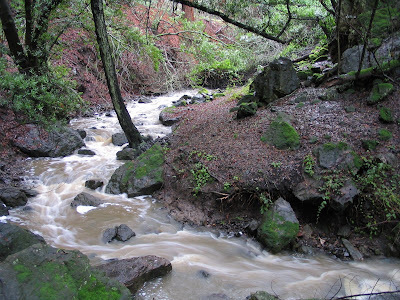 Wildcat Creek churning around ancient lava flow, Tilden Regional Park, Alameda County. 20. 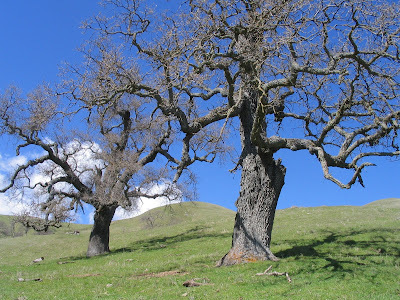 Stark twin oaks on barren hillside, Sunol Regional Wilderness, Alameda County. 21. 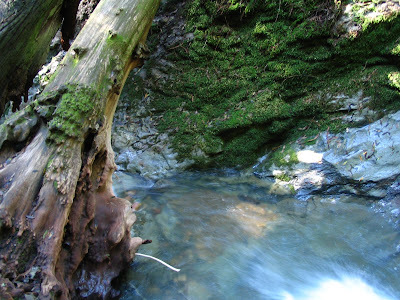 Unnamed back country creek, Robert Louis Stevenson St. Park, Napa County.